Do you have photos, historical accounts or other items pertaining to the Taconite Harbor area? Would you like to share this historical information with the world? 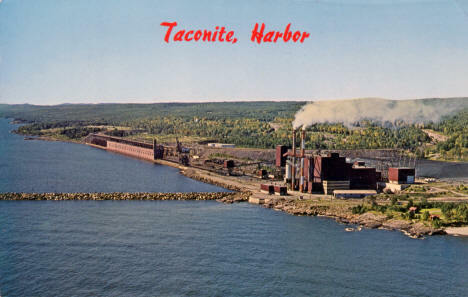 LakesnWoods.com would like to publish your Taconite Harbor photos (current or historical) or historical accounts on this website. Original materials can be returned and your privacy will be respected. Taconite Harbor is an unincorporated community in Cook County, Minnesota, United States. 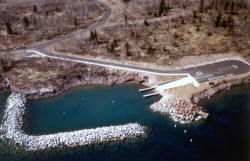 Taconite Harbor is located on Minnesota State Highway 61 between Grand Marais and Little Marais. 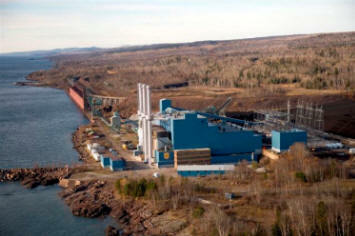 Currently, Taconite Harbor consists of a power plant, foundations and an abandoned basketball court, but the Minnesota Power Company is looking towards development on an area that they own, but do not need. 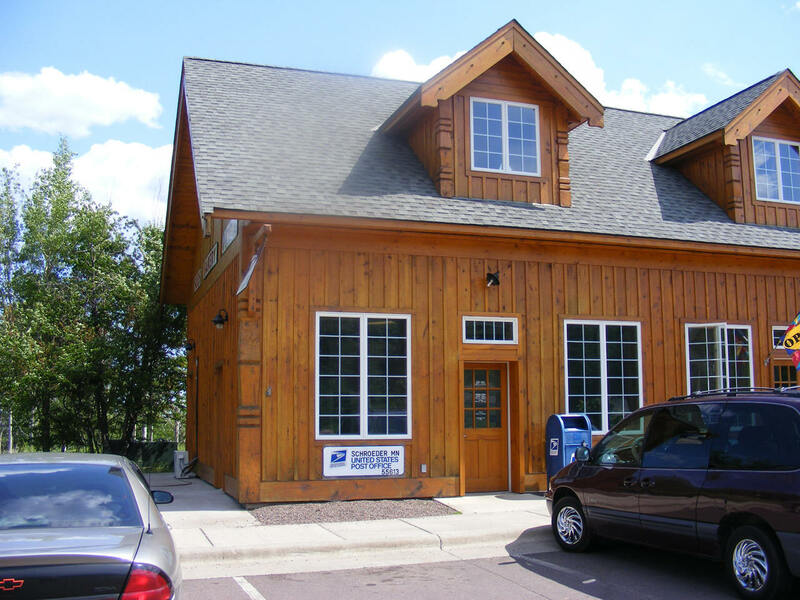 This development may include a sewer system, various commercial businesses centered around a village square, paved parking lots, and a City Hall (which would make Taconite Harbor an incorporated city). 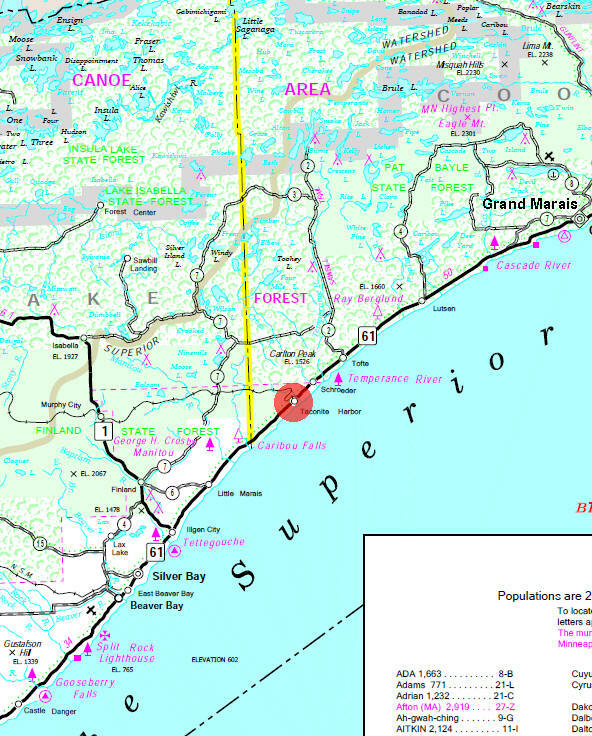 The town is also expected to be a major stop along the Gitchi-Gami Trail. As of the census of 2000, there were 187 people, 84 households, and 57 families residing in Schroeder Township. The population density was 1.2 people per square mile (0.5/km²). There were 210 housing units at an average density of 1.4/sq mi (0.5/km²). 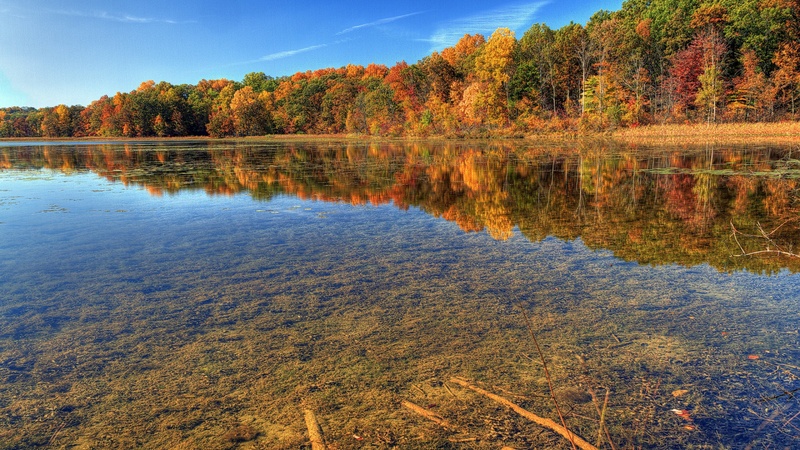 The racial makeup of the township was 93.58% White, 1.60% African American, 1.07% Native American, 1.60% Asian, 0.53% from other races, and 1.60% from two or more races. There were 84 households out of which 22.6% had children under the age of 18 living with them, 63.1% were married couples living together, 3.6% had a female householder with no husband present, and 32.1% were non-families. 21.4% of all households were made up of individuals and 10.7% had someone living alone who was 65 years of age or older. The average household size was 2.23 and the average family size was 2.60. In the township the population was spread out with 18.7% under the age of 18, 5.9% from 18 to 24, 26.7% from 25 to 44, 33.2% from 45 to 64, and 15.5% who were 65 years of age or older. The median age was 44 years. For every 100 females there were 85.1 males. For every 100 females age 18 and over, there were 92.4 males. The median income for a household in the township was $33,250, and the median income for a family was $39,375. Males had a median income of $40,000 versus $22,083 for females. 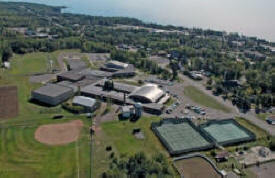 The per capita income for the township was $19,853. About 7.9% of families and 6.6% of the population were below the poverty line, including 21.4% of those under the age of eighteen and none of those sixty five or over. 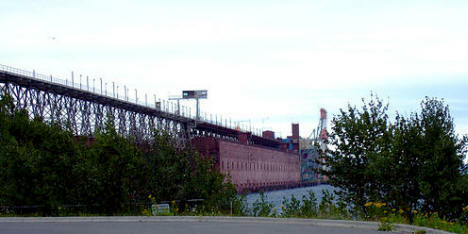 By the mid-1950s, ore supplier Pickands-Mather had extensive experience with iron ore shipping. Since they were building a new facility at the top of the lakes, they applied all that experience and built the perfect ore dock. This is it. Right at the moment it's not in use, but that is apparently just a temporary situation--perfect or no, the dock's worthless without something to ship. The trains came down from the Erie Mining Taconite plant and followed an oval trestle over the dock, rather than waiting while cars were shuffled on and off the deck. The operation was sufficiently automated that the train would never completely stop moving, and the enormous switching effort required atop a more conventional dock was no longer essential. News: Your browser does not support inline frames or is currently configured not to display inline frames. 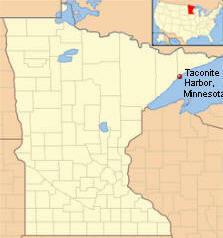 Taconite Harbor was developed in 2001 to provide a protected public access and Safe Harbor. 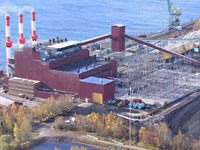 It's located adjacent to the Cliff's Erie Taconite loading facility, just south of Schroeder. Low-sulfur, sub-bituminous coal generating station. Operated by Minnesota Power, Duluth, MN. Three units, each rated at 75 megawatts, were acquired from LTV in October 2001. Units 1 and 2 operational in 1957. Unit 3 operational in 1967. Tours available by appointment. 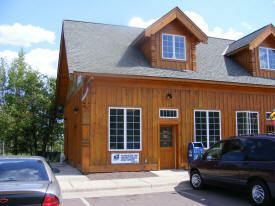 Call 218-663-7167.